Good news for the future of fusion energy: energetic ions suppress turbulence that is responsible for the 'leakage' of energy in tokamak reactors. Researchers from this FOM programme reached this conclusion after they had performed detailed calculations based on kinetic models for plasma turbulence. Such calculations require an enormous computing power. The researchers therefore used the latest generations of supercomputers. These calculations demonstrate that energetic ions ensure a stronger coupling of the turbulence with large-scale flows in the plasma, the so-called zonal flows. The structure of these flows is comparable to the layers in the atmosphere of the planet Jupiter. Thanks to the stronger coupling the zonal flows increase, as a result of which the turbulence decreases. Energy from the hot centre of the plasma can therefore leak away less easily to the cool edge of the reactor where this energy would be lost. The discovery also solves a longstanding puzzle in tokamak research. 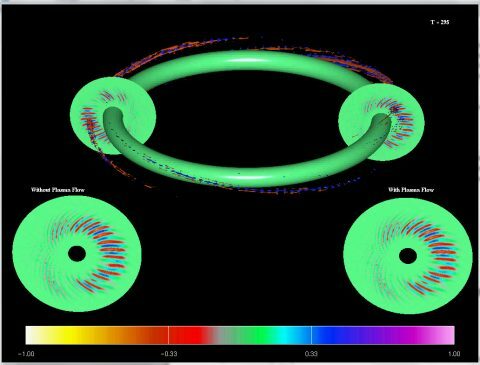 In the JET tokamak, researchers saw that less energy flowed to the reactor wall in discharges with a high rotation than in comparable discharges with less rotation. Calculations revealed that this difference in energy transport was partly due to the rotation. However, the rotation alone was not sufficient to explain the difference in energy loss. The energetic ions that are present in the rotating plasmas investigated now appear to be the missing part in this puzzle. The researchers expect that energetic alpha particles, the product of fusion reactions, could play the same role as the energetic ions in the JET experiments. Alpha particles could therefore reduce the undesired energy transport to the reactor wall as well. This means that under certain scenarios, the core of the future fusion reactor ITER could achieve a higher energy multiplication than had been thought possible up until now. 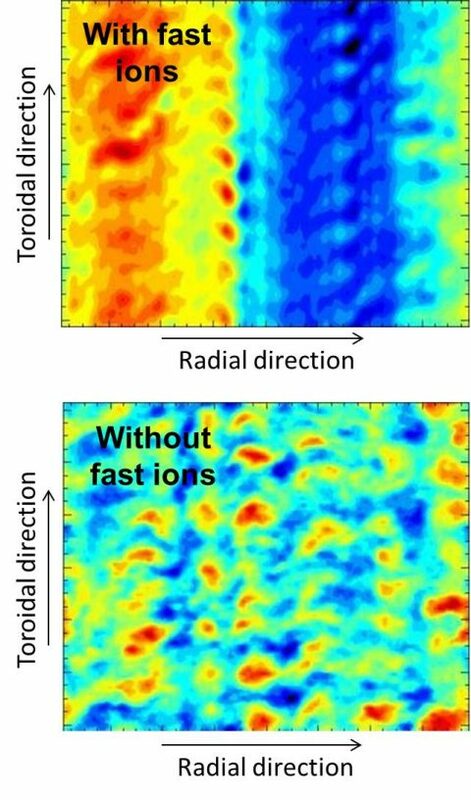 How energetic ions cause the strong coupling between turbulence and zonal flows is still not clear. This mechanism will therefore be studied further. In a plasma without zonal flows, fairly long elongated turbulent areas arise as a result of which energy from the hot centre of the plasma can easily leak away to the cool edge of the reactor. When the zonal flows are 'coupled', the turbulent cells are pulled apart as a result of which the undesired energy transport decreases. A comparison of the turbulence in a plasma with and a plasma without rapid ions.